Downtown Minneapolis: This chapter introduces Samantha’s character and takes place entirely in her downtown Minneapolis apartment. 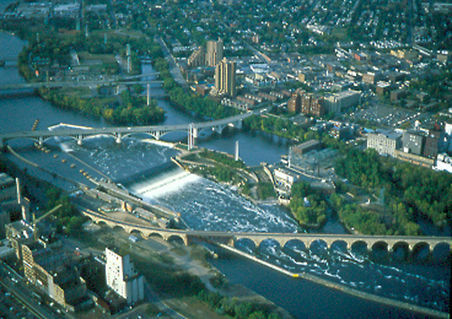 The city of Minneapolis was originally the city of Saint Anthony, built around Saint Anthony Falls. At the time the fifty-foot waterfall marked the end of the navigable portion of the Mississippi River and also provided an excellent source of water power for milling. In the photograph above the falls are slightly left of the center of the picture, the old mill is slightly right of center, and what was once downtown Saint Anthony can be seen in the upper right quadrant. Downtown Minneapolis would be to the left of the area shown in the picture. Saint Anthony is no longer an independent city, as it became part of Minneapolis many years ago. 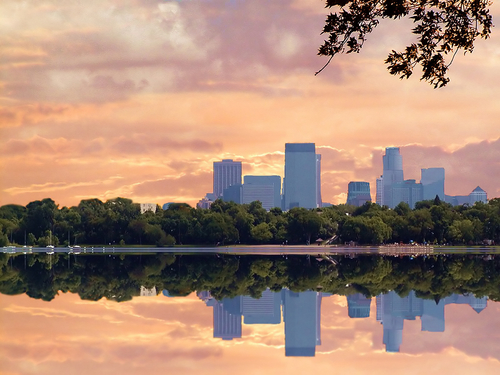 This second photo shows the Minneapolis skyline. From this angle the view of the Mississippi River and Saint Anthony would be on the other side of the skyscrapers that fill today’s downtown. One of the city’s famous lakes is visible in the foreground. In the skyline picture above many of the high-rises are either apartment buildings or condominiums. Samantha works as a help desk technician which pays well enough for her to afford a decent downtown apartment. While she works in downtown Saint Paul, many bus lines in the Twin Cities run between the two downtowns so it is not difficult to live in one downtown and work in the other. The night life in particular is far superior in Minneapolis. Despite some efforts at development, downtown Saint Paul remains pretty much empty after about 8 or 9 PM most evenings – at least, that’s the way it was when I lived in Saint Paul a number of years ago. Because of this Minneapolis would be a much more appealing place to live for a younger person like Samantha, well worth the fifteen or so minutes on the bus to and from work.